The Jeep Compass is a compact 4x4 which is well priced and is the most fuel efficient car the company has ever built. It is comfortable, but visibility is poor. Interested in buying a Jeep Compass? Four equipment grades are offered: Sport, Sport+, Limited and 70th Anniversary. Sport models feature alloy wheels, air-con, electric windows and mirrors, cruise control and a CD player. Sport+ models add climate control, Bluetooth and a dimming rear view mirror while Limited models have heated and electric leather seats and an enhanced audio system. Range-topping 70th Anniversary models have bespoke trims and wheels. A 2011 facelift of the Jeep Compass, which originally went on sale in 2007, sees a radical facelift of the front end. It carries Jeep’s trademark seven-slot grille and revised bumpers at the front, and it is here where the Compass is at its most handsome. Squared-off wheel arches are part of Jeep’s design tradition, but look awkward shrouded in heavily flared wings. The rear door handles are hidden in the bodywork for a smoother look. The Compass was criticised for a poor interior when it launched in 2007, but the revised model has a completely redesigned cabin. It certainly looks more upmarket, but the plastics used are hard and appear to be susceptible to scratching very easily. The leather seats fitted as standard to top-spec models lack an upmarket feel. Instrumentation and controls are easy to read, and the raised gearstick is well placed. A pair of 2.2-litre diesel engines are available with 134bhp in the front-wheel drive Compass and 161bhp in the four-wheel drive version. The diesels will reach 62mph in 11.5 and 9.8 seconds respectively and have identical top speeds of 125mph. We tested the 161bhp version and found it to be a strong performer, although slightly noisy under acceleration. A 2-litre petrol engine is offered, while the only automatic in the range has a 2.4 petrol. Performance for both petrol models is virtually identical with 10.5 second 0-62mph time and a 115mph top speed. There’s enough space for four adults to travel in comfort, but a wide transmission tunnel means a fifth passenger will need to sit with a leg either side. Measuring 458 litres, boot space is around 100 litres smaller than the Kia Sportage and around 130 litres smaller than the Hyundai ix35. The rear seats fold flat and there’s plenty of storage space in the front, with a large shelf ahead of the passenger, several recesses, cupholders and a box between the front seats and decent sized door pockets. The windows seem narrow which restricts visibility. Diesel Compasses benefit from engines co-developed by Mercedes, and the petrols are sold across the world in massive numbers which should offer confidence. Jeep trades on its ruggedness, however they have a worse reputation for reliability than other 4×4 manufacturers. The interior trim feels a little low-rent. 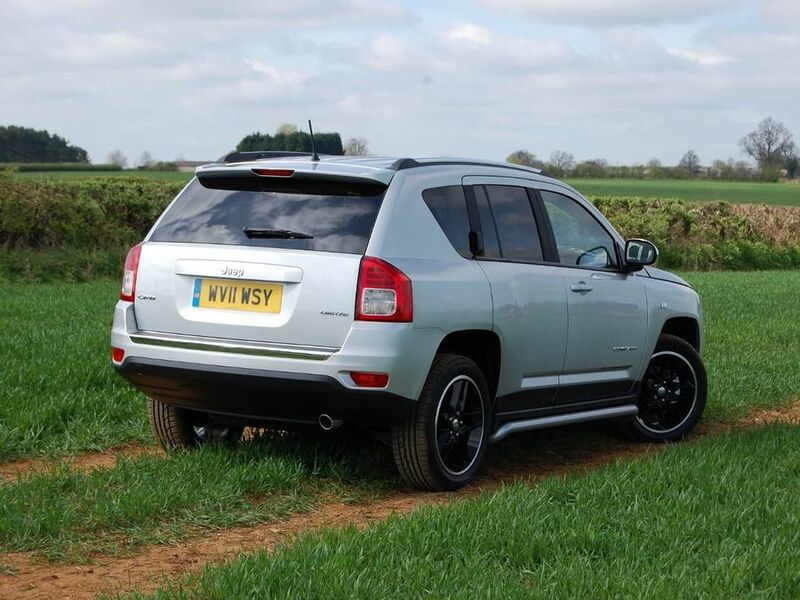 The Jeep Compass offers a decent ride, although it can become unsettled at speed over poorer road surfaces. The chassis remains composed when cornering and doesn’t offer the kind of lean which is often people’s perception of these kinds of cars. The steering is vague and offers little in the way of feedback. For the first time in a Jeep, a two-wheel drive version is offered, although we tested a four-wheel drive version which afforded plenty of grip on the road. The Compass is priced from £17,000 which matches the Kia Sportage and Hyundai ix35 but both rivals are marginally more fuel efficient. However, it undercuts models such as the Nissan Qashqai and Volkswagen Tiguan, but all four rivals are likely to retain more value when they are sold on. The diesels register low to mid 40mpg figures, and CO2 figures in the 160-170g/km area means they’re slightly dearer to tax too. The Jeep Compass performs poorly in crash testing, having been awarded just two stars by Euro NCAP. Despite being tested with the optional side thorax airbags, it offers little occupant protection and is similarly bad in pedestrian impacts. Electronic stability control and brake assist are fitted as standard, however. Rugged looks and good equipment levels make the Compass a good introduction to the iconic brand.